Allergies are your immune system’s reaction to a foreign substance identified as dangerous or harmful. While your allergies may happen for a good reason as a defense mechanism, it doesn’t make them any less uncomfortable or unbearable. Luckily, an array of options exists when it comes to treating and preventing allergies. Allergic reactions happen with varying severity, from mild discomfort to life threatening responses. This all happens because your body produces antibodies meant to fight off unwelcome invaders that could make you sick or give you an infection. Usually an allergic reaction consists of inflamed skin or rashes like hives, a stuffy, congested, or runny nose, and even difficulty breathing or ingesting certain foods. Allergies cannot be cured, but they can be managed and even avoided by following a few simple rules. At FastMed, we strive to get you in and out of our clinic in under an hour so you can get on with your day, hopefully allergy free. We also work hard to be an affordable alternative to the ER by offering things like a savings plan. FastMed Urgent Care’s mission is to serve our communities and patients with a high level of quality, personal care, affordable and convenient urgent care, family practice, and other specialty medicine services. 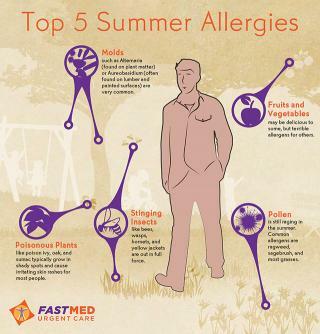 Our compassionate staff of top-notch professionals is here to help you feel better, so visit your local FastMed Urgent Care clinic for an allergy consultation and relief.